(23139.IO.O.F.C.8.9, Devon/Dunning Petroleum Industry Collection, OHS). The most prolific early oil field in Oklahoma was discovered in Creek County about twelve miles east of Cushing and one mile north of present Drumright. Drilling began in January 1912 when Thomas B. Slick and C. B. Shaffer spudded in a well at a location on the Frank M. Wheeler farm. The well was completed on March 12, 1912, at a depth of 2,319 to 2,347 feet in the Wheeler sand for an initial production of four hundred barrels per day. Slick managed to keep the discovery a secret for almost two weeks while he and his partner leased as much of the surrounding property as possible. When word of the discovery leaked out, a mad scramble for leases developed, and an oil boom erupted with the town of Cushing as its supply center. After about eighteen months the excitement had begun to wane, and on November 30, 1913, the Prairie Oil and Gas Company brought in a massive producer from the Bartlesville sand at a depth of twenty-six hundred feet. This new production horizon, with many of its wells producing eight thousand barrels or more, rejuvenated the boom, and drilling proceeded at a feverish rate. In January 1915 yet another prolific pay horizon was discovered in the northern part of the field. It produced around ten thousand barrels, escalating activity even more. Daily field production peaked in May 1915 when 3,090 wells produced 310,000 barrels of oil. By the end of 1919 the Cushing-Drumright Field covered thirty-two square miles in western Creek, southeastern Payne, and northeastern Lincoln counties and had produced 236 million barrels of oil since its discovery. In that same year the field produced 17 percent of all the oil produced in the nation. Additionally, almost fifty refineries and ten natural gasoline (casinghead gas) plants were built in the area of the field, and numerous pipelines made marketing Oklahoma oil much easier than in the past. Flush production, ranging from twenty million to fifty million barrels per year, continued from 1912 through 1919. All this activity created massive amounts of waste and resulted in the development of Oklahoma's first oil and gas conservation activity. On July 1, 1914, Order Number 829 by the Oklahoma Corporation Commission was issued to help curb overproduction in the Cushing-Drumright Field. Just as in other states' oil booms, massive waste of oil and gas caused a rapid drop in production throughout the 1920s and 1930s, until by 1955 the field was only producing 6,209 barrels per day. Along with this came the closing of the refineries, which were all gone by the 1990s. As in all oil booms, several towns developed to service the activity, and they encountered the usual problems of overcrowding, lawlessness, and general chaos. Cushing, already a small thriving town, became the operations center of the field and quickly grew from a few hundred to more than five thousand residents by 1916. Drumright, at the center of the field, was founded in 1913, less than a year after the discovery well was drilled. At its peak the town had an estimated population of twenty thousand and managed to survive throughout the twentieth century as a small community. A number of others, for instance Markham and Pemeta, both founded in 1914, Shamrock, Capper, and Quay (originally Lawson), withered or disappeared after the boom ran its course. Oilton, established in 1915, survived the twentieth century, and Yale, already in existence at the beginning of the boom, also remained a viable community. The Cushing-Drumright Field, which produced such spectacular wealth, brought significant change to the Oklahoma oil industry. Its influence directly caused the first oil and gas conservation activity by state agencies. For the first time a significant number of refining operations developed, which, along with huge pipeline growth, significantly helped the area to become a more independent financial entity. 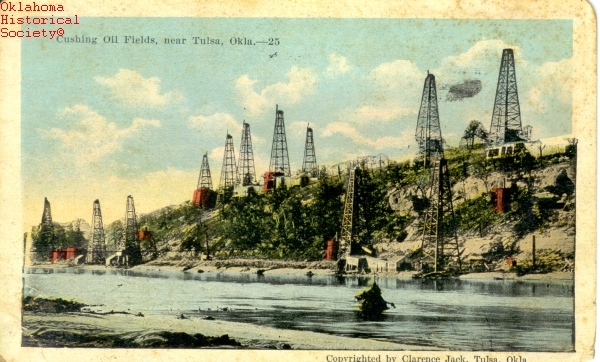 Moreover, Oklahoma became the focus of national oil production just at the beginning of World War I when a huge quantity of petroleum was needed. George O. Carney, Cushing Oil Field Historical Preservation Survey (Stillwater: Department of Geography, College of Arts and Sciences, Oklahoma State University, 1981). Bess Mills-Bullard, "Digest of Oil and Gas Fields," in Oil and Gas in Oklahoma, Oklahoma Geological Survey Bulletin 40, Vol. 1 (Norman: Oklahoma Geological Survey, 1928). Carl Coke Rister, Oil! Titan of the Southwest (Norman: University of Oklahoma Press, 1949). Bobby D. Weaver, "Cushing-Drumright Field," The Encyclopedia of Oklahoma History and Culture, https://www.okhistory.org/publications/enc/entry.php?entry=CU008.